I do love a nice Chelsea bun. It brings back memories of going to the dentist. My Mother who was usually very health conscious would take us to the baker’s shop to buy a treat before taking us back to school – usually a Chelsea bun or a dripper. My sister and I would gingerly eat the doughy mouthfuls, our gums still frozen and tingling from the anesthetic. My children, however, do not relate to this at all. Brought up as ex-pats all their lives, the patchwork of their childhood food experiences is very multi-cultural but they were aghast that this ‘boring’ bun was my first choice when we visited a baker this Summer in the UK. They are drawn to sweet treats from brands that seem to be taking over the world and making every city into a carbon copy. I can’t help feeling rather sad about this as though a bit of their English heritage is being lost. In fact I can feel a ‘History of the Chelsea Bun’ session coming on (and there is a really good one on Baking for Britain). This month’s Fresh From The Oven Challenge was set by Wendy from the Quirky Kitchen and while delighted to make Chelsea buns, as the only dried-fruit eater in our family I knew that it would be a slippery slope if I made nine of them. However my youngest daughter adores Cinnabon so inspired by a great ‘taste alike’ recipe from gorgeous Tartelette I split the filling half and half. How easy these were to make (whichever version you choose). The icing on the cinnamon rolls is decadently addictive and my teens declared it better than Cinnabon ( and better than Betty Crocker – where did I go wrong?). I would rather our less-healthy treats are home-made from good ingredients even if the calories are rather empty than sell my soul to a multi-national any day! Go on – try them and see. P.S. 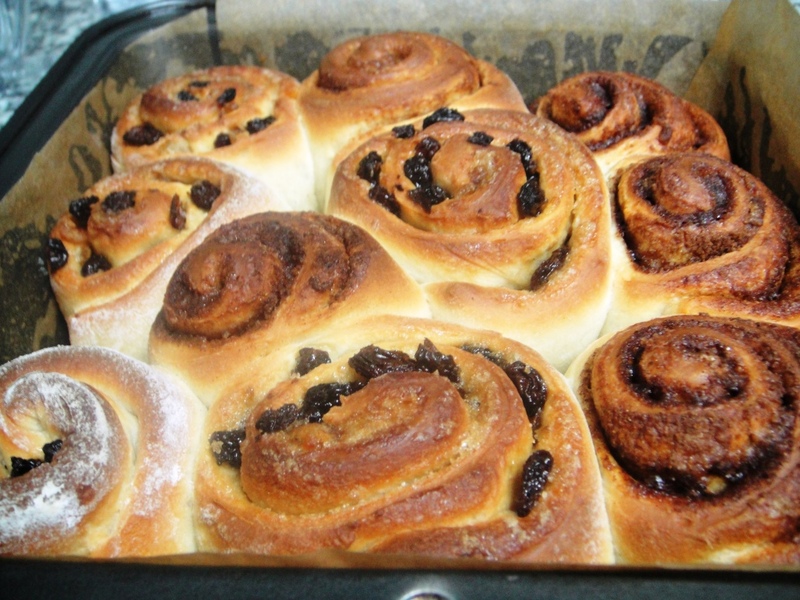 Don’t forget to check out the Fresh From the Oven site to see how everyone else got on with their Chelsea bun making. Combine the flour, sugar, salt and yeast (if using fast action yeast) into a mixing bowl. 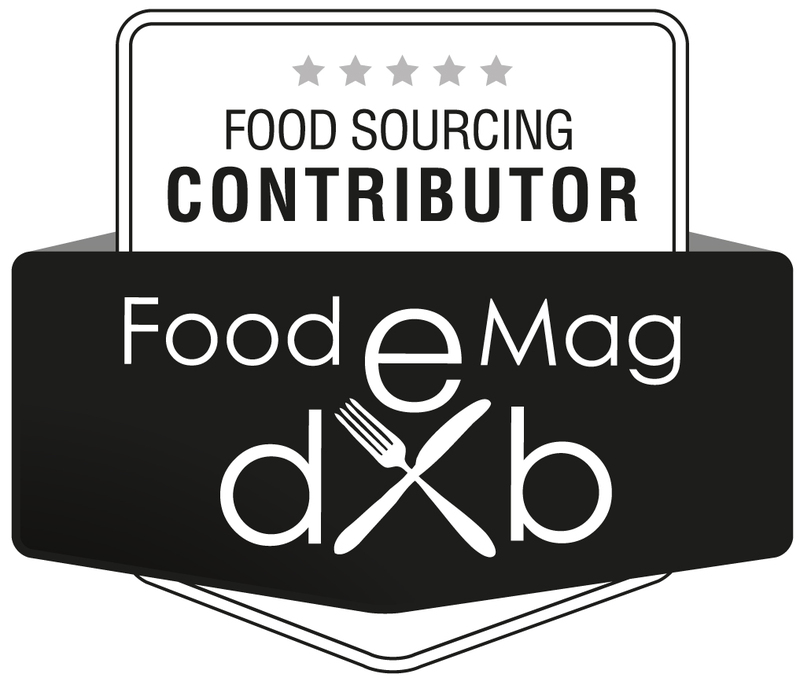 If you use active dried yeast (usually the only choice in Dubai) add it very slowly, grain by grain, to the warmed milk stirring all the time. Make a well in the centre and add the softened butter, egg and milk. Mix to make a soft dough. (I used my KitchenAid with the paddle and then changed to the dough hook). Knead until smooth. Cover and prove until doubled in size. This took about an hour and a half (although Wendy says her airing cupboard can do this in around half an hour). Generously butter and line a 18 cm (7 inches ) square tin. Make sure it’s not a loose bottomed one, or you’ll get problems later on and lose your filling. Flour your work surface, and roll out the dough, (no need to knock it back) to a rectangle measuring about 30 x 23 cm (12 x 9 inches). If you get the edges as square as you can it will help to make your buns look even, but I quite like the squiffy homemade look. Spread the softened butter as evenly as you can over the dough. Sprinkle the sugar and the dried fruit on top (or the cinnamon sugar) and gently press it into the butter. Now, roll up the dough along the long edge, as though you were making a Swiss Roll. Seal the edge. I find that smoothing it down with the flat side of a paring knife can help here. Turn the roll over so that the seal is underneath and cut the roll into 9 equal buns (I made 10 as I did half and half filling). Place the buns, cut side down, into the buttered and lined tin, and leave to prove until the dough has doubled in size, and they have all joined together into one big Chelsea bun muddle. I baked mine in a 180 degree oven, for 20 minutes but check after 15 minutes. Once cooked, cool on a wire rack. For the Chelsea buns drizzle honey on the top while still warm, for the cinnamon buns top with the icing after 10 minutes. 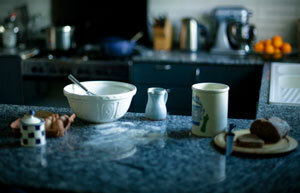 Mix the butter and cream cheese in a large bowl with an electric mixer on high-speed. Add the icing sugar and mix on low-speed until the sugar is incorporated, then add the milk and vanilla. Mix on high-speed again until the icing is smooth and fluffy. Once you make one batch, I guarantee you’ll soon have to make another. Which ones are your favourite? Thanks for joining me for this month’s baking challenge. Do you have a traditional favourite or fond memories of a sticky bun? I can remember the bakers at Hester’s Way, and the one on the Industrial estate, where all the workers used to queue out of the door – I know they both did excellent honey buns! …and Locke’s bakery? I’d forgotten honey buns. sally… i so agree with you!! traditional recipe really have to put up a hard fight in the global village. and you’ve really been creative by creating cinnabon with the chelsea buns. me? 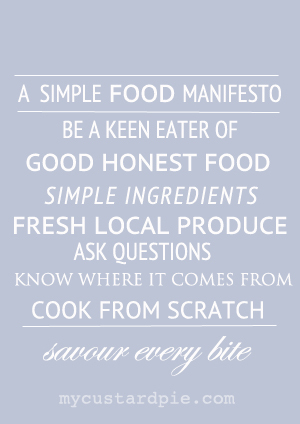 i would much rather eat them than have to make them… looks very complicated, though you make it seem so very easy!!! your kids are very lucky to have you as a mum! 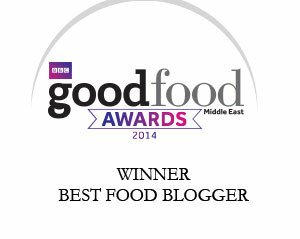 Arva and Rajani, such kind words from such lovely foodie friends. 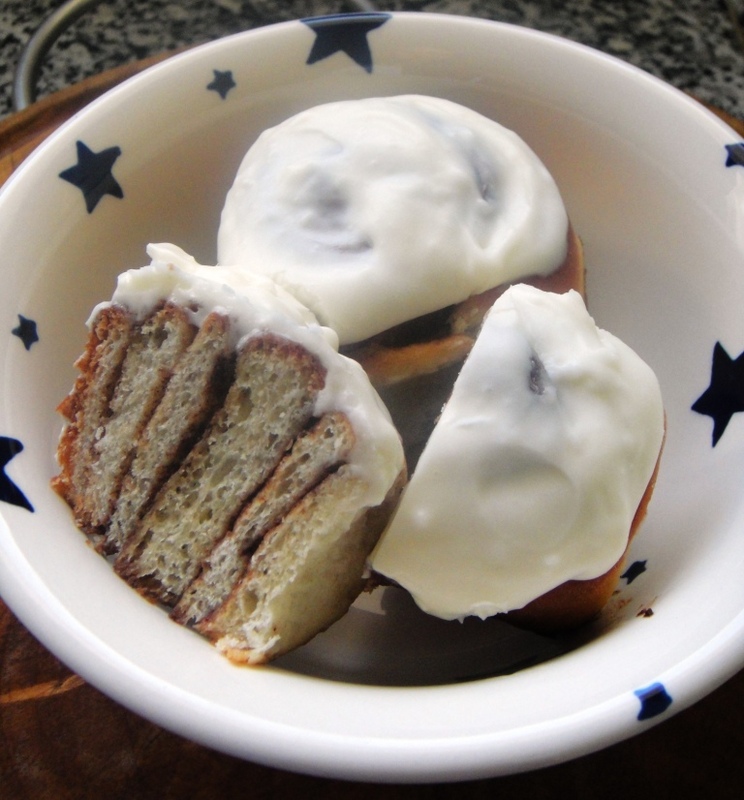 Chelsea buns were something new to me, I had to google them to see exactly what this challenge was for. But I anticipated it to be a tasty one, since it’s related to so many warm childhood memories. And indeed these buns were really delicious. So glad and I loved your interpretation Silvia – very elegant. Love the plate you have displayed it on. Totally BRITISH! These are soooo good. They have everything you will need to start your day off in a good way! YUMM! These are absolutely beautiful! Light and fluffy the perfect cinnamon bun (from my American childhood)! 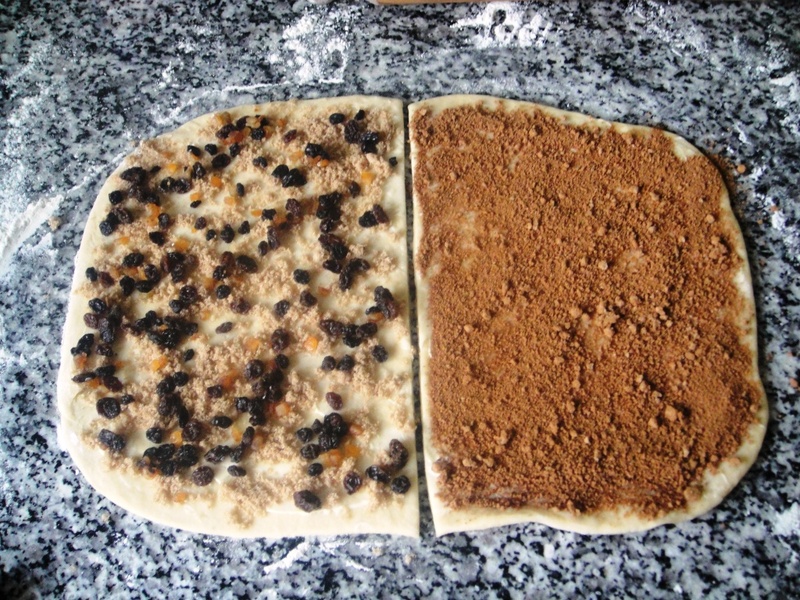 And I love that you divided the dough in two for two different fillings. Thank you Chele, Jamie and Joudie for your lovely comments. Thanks for your comment on my post. I appreciate the cheerful words when it felt like a failure! Believe me Sarah I’ve had my fair share of disasters (read Tracy Emin & walnut bread for instance) and have read your successes while lamenting them. What a great way to go Sally…I ♥ the half and half idea.I think I saw Chelsea buns at Sarah’s blog yesterday! Mmmm tempting buns these. I’m HUNGRY!! I know what you mean Deeba. I visited a few more of the Chelsea bunners from the Fresh From the Oven group and I was suddenly ravenous and craving one! Thanks for the visit, Sally!!! I am so tired and run down from working hard, a cup of coffee and a chelsea bun will me heaven right now!! Shame. I wish I could send you one Nina. Glad they went down well in your house! Thank you for taking part in this month’s challenge. I love Chelsea buns, but it seems so hard to get a good one any more. I am bookmarking these ones to give them a try, because these look gorgeous. Thanks for sharing them. As I’ve said on several chelsea bun posts this week, I unwittingly joined in with FFTO having made chelsea buns at the same time although it will be a few weeks until I blog them. These look wonderful, well done! I look forward to reading about your buns Sarah! This was a classic recipe – very easy and delicious. Give the vanilla icing if you want indulgence though – would work so well on many things. Loving your patriotic pic! I don’t actually have good memories of Chelsea buns as a child, I think they were too hard and the raisins were burnt and chewy. These are divine though aren’t they. Glad the kids like them. Burnt currants are horrid aren’t they. 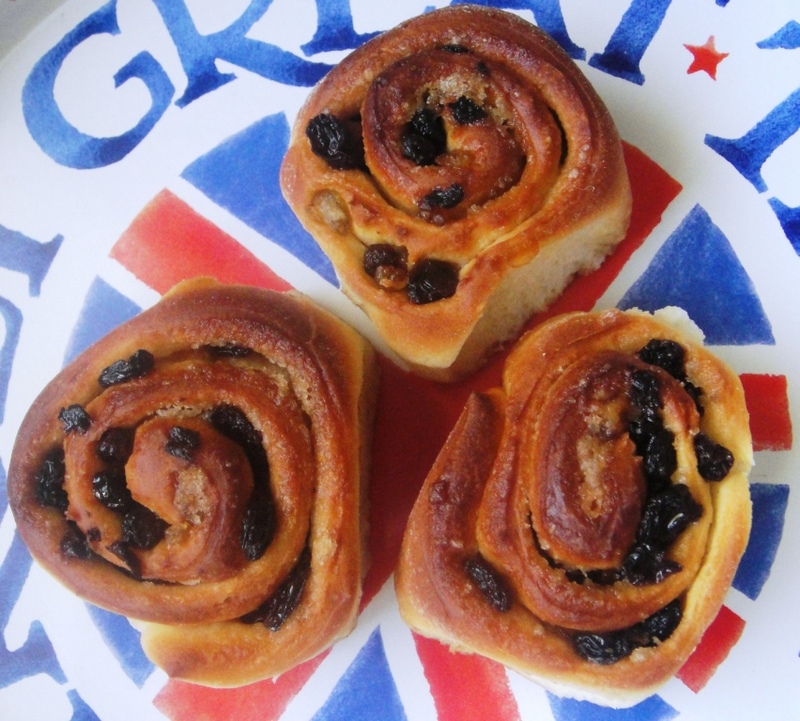 I remember Chelsea buns being quite soft and unwinding them to eat them. I have never heard of Chelsea buns. These looks soooooo good. want some with my cuppa. A cuppa is mandatory with them Soma. i’m getting up right now. and demolishing the lot of it. Don’t buy one, make some…go on….they’re so much nicer and you’ll have lots! These look extremely nice, I have the exact same Emma Bridgewater tray!